Ok, so I know that title might make it sound like we’re heading off to survival camp in the woods. But the fact is that unless you live in the Southwest, you can pick free, healthy food up off the ground this this time of year. Nuts are chock full of healthy fats and protein, and from August through October/November they just start falling off the trees, waiting to be picked up. Last fall I saw them everywhere on my walks, especially black walnuts and chestnuts. But I was “too busy” to pick them up off the ground and learn how to eat them. Well, that’s something I really regret so I resolved that this year, I’d learn how to do it. There are a LOT of different nuts we can forage. Many are growing right in our yard or in our neighborhood. So I’ll be writing at least two or three posts to cover all these nuts, and how to harvest and cook with them. So, let’s take a look at some common nuts, and how we can prepare them to eat this fall. YUM! Want to know something cool about chestnuts? They’re really more like a vegetable than a nut. The reason is because they have a high starch content and, when cooked, resemble more of a potato. As you can see from the picture at the top of this post, chestnuts fall to the ground in prickly burr shells. When harvesting chestnuts, it’s important to wear gloves. 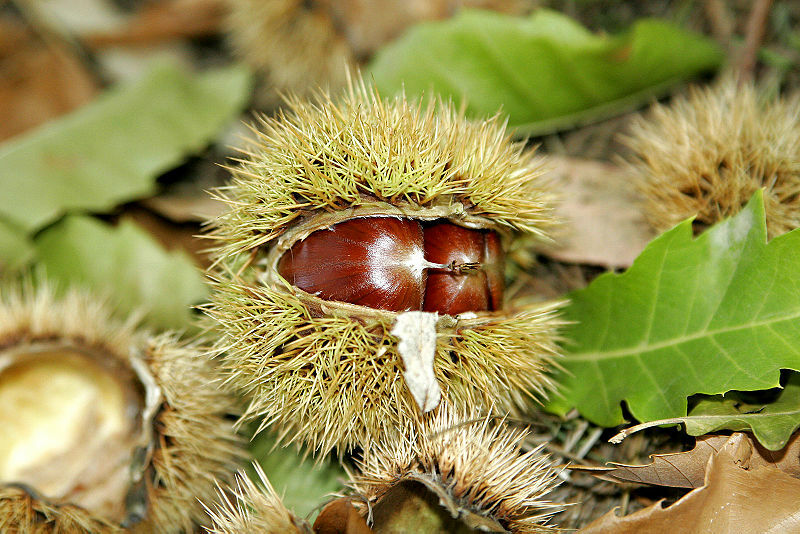 Pick up the chestnuts that already have an open shell, just like the one in the picture. Again, wearing gloves, peel away the prickly burr outer shell. Chestnuts can be stored in the refrigerator for a month, and in the freezer for up to one year. You can also store them in your basement between layers of sand. To do this, however, you must soak them in water for 20 hours immediately after harvesting them. Let them dry completely and then pack them in sand, making sure the chestnuts don’t touch each other. Chestnuts are an excellent source of Vitamin C (they’re the only nut to contain this vitamin). There are many ways to prepare chestnuts for eating. You can roast, boil, steam or grill them. You can also grind them up to use as flour. The simplest method, and probably the most popular, is to roast them. 1. Using a small paring knife, make an “X” on each shell. This is really important! If you don’t do this the shells could explode in the oven. 2. Place on a baking sheet, and roast in a 425 degree oven for 35 minutes. 3. Peel off the papery shell as soon as they’re cool enough to touch. But don’t wait until they’re completely cooled; the colder the nut gets the harder the shell will be to get off. 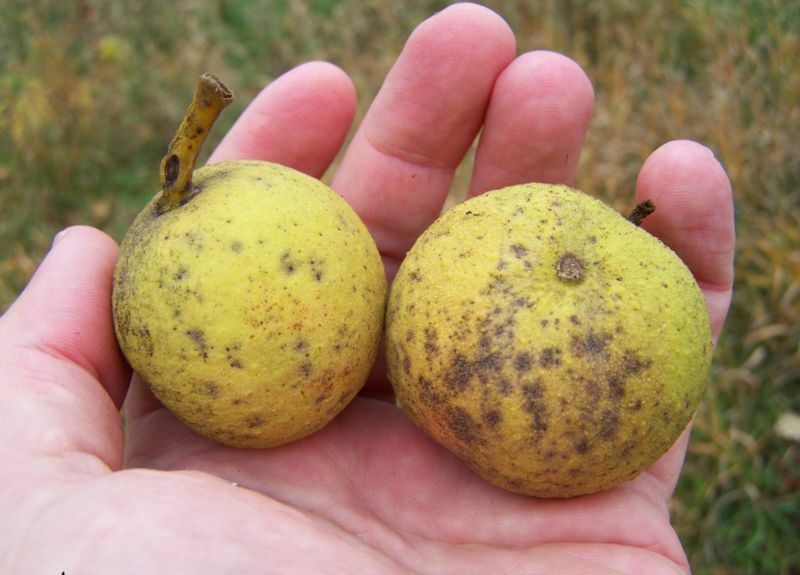 Black walnuts are most common from Texas on up to Wisconsin, and all points east. Missouri has the largest wild harvest of black walnuts. If you have a black walnut on your property, then you know what a pain they are. They stain the ground, and if they happen to fall in your head they hurt. I’ve got one black walnut tree right across the street, and my neighbors loathe it due to the mess it makes in their yard every year. They just pitch the nuts into their yard waste. But it’s good for me because this year, I’ll offer to take all those annoying nuts off their hands! Black walnuts are a delicacy if you take the time to harvest and store them. These fruits start dropping in late August through September in most places. And, they’re a fantastic walnut to add to bread, salads, ice cream and cookies. They also go great with chicken, pork or fish. First, make sure you only pick up black walnuts that have fallen to the ground. Never pick them off the tree! They’re not ready until they’ve fallen because the outer shell is simply too hard. Also, picking them off the tree will damage branches and limit next year’s nut production. Probably the easiest way to get the hard, green outer shell off is to put them in your driveway and, wearing heavy boots, roll them hard under your feet. If you have a lot of nuts, you can also use your car. It’s best to do this method if you have a dark driveway. These nuts stain! If your driveway is light (like mine) then you could do it on the street. There are other methods, using a knife to score the shell, which you can read about here. The shells are easiest to get off when they’re green; as they start to turn black they harden, so try to harvest green shells first. Go out daily, if you have a black walnut tree close to you, to pick up nuts. Important Note: Black walnuts produce a toxin known as juglone. 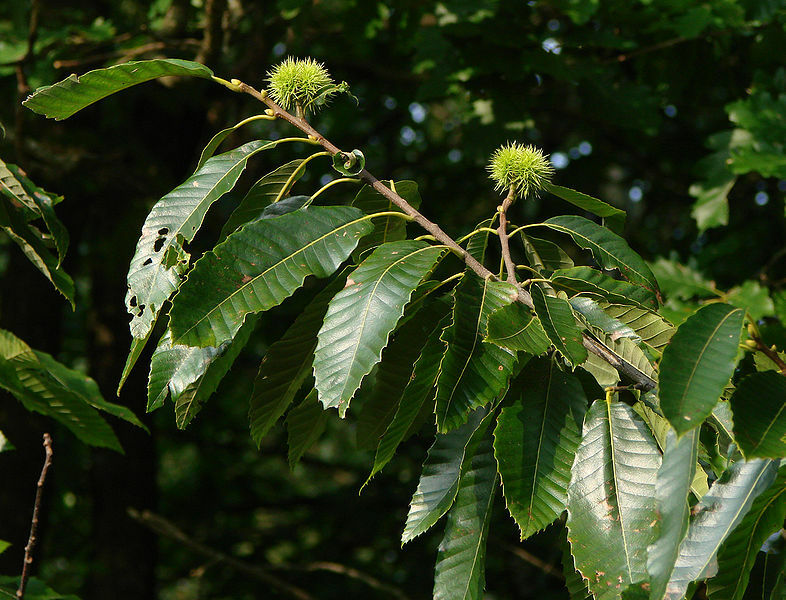 This toxin is harmful to other plants (which is why you’ll find black walnut trees standing all by their lonesome: this is so they get the most sunshine!). When deshelling black walnuts do NOT put the shells (this includes the outer green shell) into a compost pile or in your yard. They need to be thrown away, or tossed in an area you definitely don’t care about. It’s also important to note that when you break open the green shell you’re likely going to find the larvae of the husk fly. They don’t damage the nut in any way, so it’s not a big deal. To get them off, you can drop the black walnuts into a bucket of water so they larvae drown. Air dry the nuts on a screen in the sun for several hours. Northern gardeners should then put the nuts into an unlit gas oven on cookie sheets for 24 to 48 hours in order to dry the nuts inside and out and prevent any mold that might form inside the nuts while they are being cured. The pilot light will usually keep gas ovens at about 110ºF, which is perfect for drying most things except fruit leathers. I prefer to use my herb dryer because excess moisture is carried off much more efficiently. To cure the nutmeats, place the nuts in an onion sack or mesh bag, and hang up in a ventilated indoor area for 4 to 6 weeks. The nutmeats should be extracted immediately after curing. If that is not possible, the nuts can be stored in air-tight gallon jars. Southern gardeners may have enough sun and warmth to eliminate excess moisture levels out of doors. Here is my method: while holding the widest part of the nut between middle finger and thumb, place the the nut (end-to-end) between the near end of the vise jaws Note that I do not plan to crack the shell at the sides. Place the thumb above the nut and four fingers below the nut. Apply pressure until the shell only just breaks, then put the shells into another container. I prefer to catch all the parts and pieces in the hand which is under the nut, but the process would not harmed by letting everything fall into a container under the vise. However, unless your thumb covers the top of the nut as well during the cracking process, pieces will fly everywhere, and there will be nutmeat losses too. Using this method, you should be able to crack 100 nuts in eight minutes. As you can see from the picture, black walnuts stain everything they come into contact with. You can use the shells as dye for fabric (just toss them in boiling water and let it stain the water, then dunk your fabric in and let it soak). This might be a fun project to do with t-shirts, curtains or even paper! I’m really excited to try harvesting nuts this year! They should start falling in the next few weeks, so I’ll keep you updated on how it’s going. Do any of you harvest nuts? Have any tips you’d like to share? If so, I’d love to hear them! I don’t k now about the rest of the southwest, but in New Mexico you CAN forage nuts – delciious, healthy, full of protein PINE NUTS, also called PINON. You know the ones that sometimes have a fancy Italian name and are super expensive in the grocery store? They are free for the picking from the pinon trees that grow on the mesa tops. Can be frozen with the shells on, rooasted, or stored raw. 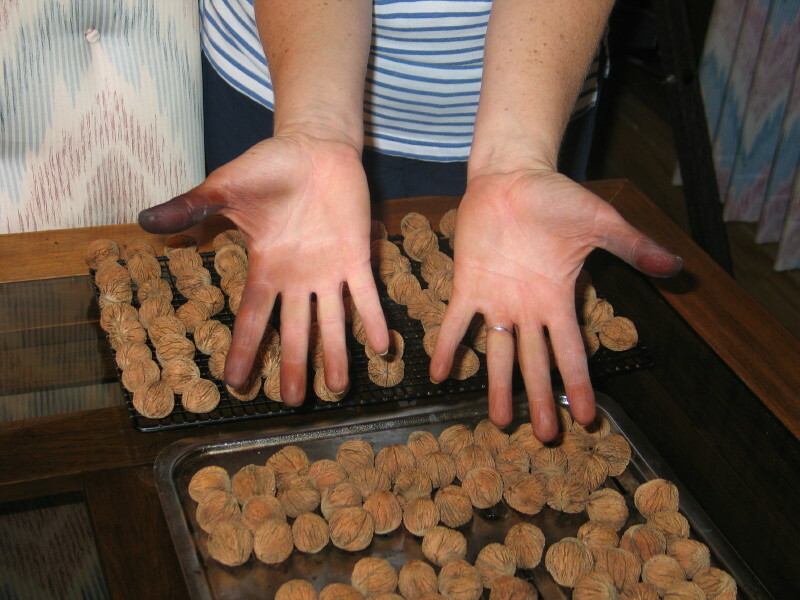 I have foraged for black walnuts before and my hands were way darker than that! Also it took about two weeks to all come off. I will say that with all nuts, you should probably store them inside and not leave them to dry outside. The pesky squirrels dug through all and took the good ones, leaving us only with empty shells. They seemed to know which were the quality nuts.